Here and following are the eight images I made for CCHMC (Cincinnati Children's Hospital Medical Center), Emergency Department, in 2014, beginning with "Spring." The theme was "Enchanted Forest", with local (Ohio) flora and fauna, through all four seasons. I made a "full view" and a "close-up view" of each season (22" x 30" each). The main technique is collage, with some print-making. I used hand-made and other special papers to do textural rubbings with oil pastels and beeswax crayons, which I then painted with acrylic paints, and then used to compose these scenes for children and adults...I've incorporated the client's needs/desires (for children and accompanying adults; local, seasonal nature/forest scenes; sense of calm (it's the emergency room! ), etc.) into my work. So, there are lots of little animals, other hidden things to look for, within multi-layered and intensely colored compositions. At least one cardinal flies through each scene. 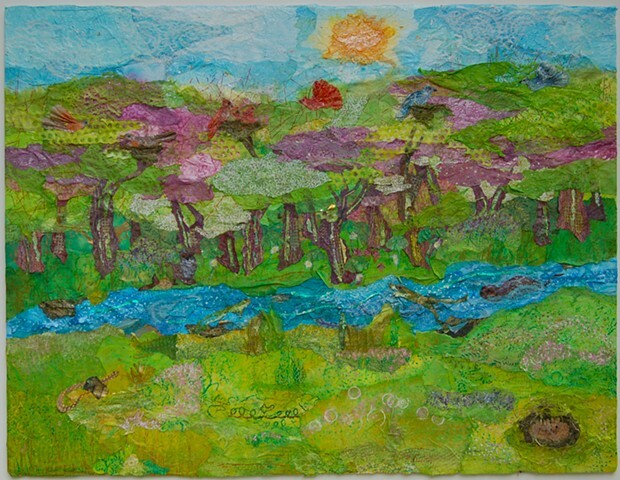 Note on the technique: I've made these pieces with methods resembling fabric-dyeing and quilt-making, but the materials here are paper, oil/beeswax pastels, and paint.